'Blue Bird' hibiscus, that is! 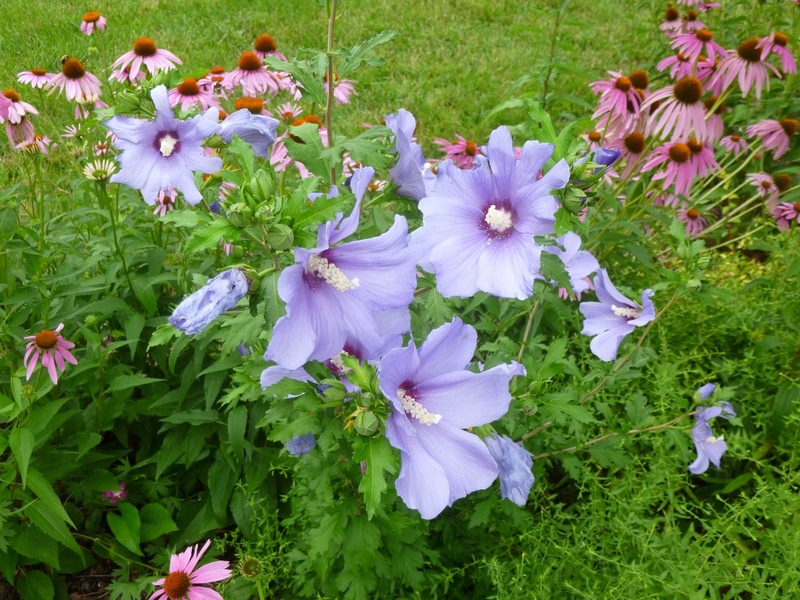 I was inspired by a post on Deb's Garden to snap this photo of my hardy 'Blue Bird' rose of Sharon (Hibiscus syriacus). Doesn't it look lovely surrounded by all the purple coneflowers (Echinacea purpurea)? The coneflowers attract bees, butterflies and hummingbirds to my garden. Sadly, the only wildlife that seems attracted to rose of Sharon so far are deer and Japanese beetles. Alas! Still, while I make many gardening decisions based on a plant's ability to support bees, birds and butterflies, I do make occasional exceptions -- and 'Blue Bird' is one of those exceptions. To earn that exceptional status, a plant must be tough, carefree and beautiful, and 'Blue Bird' ticks those boxes for me. PS - Some rose of Sharons have a reputation for invasiveness. I bought 'Blue Bird' thinking it was sterile, but that was a goof on my part, because apparently it is fertile. Nonetheless, I have not noticed any seedlings yet. Right now, I don't find it onerous to remove spent flowers before any seedpods have a chance to form. Perhaps when the shrub matures, that task might be more onerous... I did buy a sterile 'Diana' rose of Sharon, but so far it seems less vigorous and the deer are more inclined to munch on it, so I don't know how many flowers it will produce this year. PPS - Looking to get notifications of new Garden of Aaron posts delivered straight to your email inbox? Now you can subscribe via email!